To promote innovative researches from students, Ubertone organizes the Ubertone Student Award. 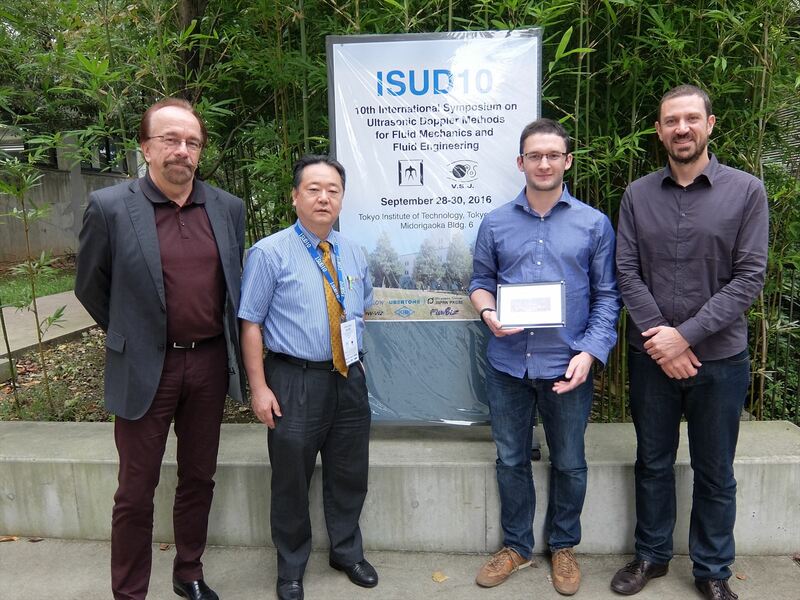 Since 2012 and at each edition of the ISUD (International Symposium on Ultrasonic Doppler Methods), papers and presentations of the students are graded by each member of the scientific committee. The best student is awarded by the Ubertone Student Award. Damien Dufour has been selected for his outstanding paper entitled Study of the rheological properties of the retropulsive jet build by the antral contraction wave in a simplified artificial stomach. The jury has also appreciated the quality of his oral presentation. Damien Dufour is graduated from the French engineering school Telecom Physique Strasbourg and he is a PhD student in the Laboratory of Food Process Engineering, ETH Zürich, directed by Prof. Erich J. Windhab. His current project aims to better understand the digestion process in the stomach. The food is digested in the stomach by a combination of chemical and mechanical action. The wall of the stomach creates a peristaltic wave motion which generates a strong retropulsive jet. The flow generated participates in the disintegration of the food, thanks to a stretch flow. In addition, this flow helps the chemical reactions by mixing the food in the stomach. His project is focused on the action of the fluid mechanics on the disintegration of the food. The measurements at high resolution of the velocities inside the artificial stomach was made possible by the use of the UB-Lab velocity profiler. Especially, by having access to the raw IQ data (demodulated sampled Doppler signal) M. Dufour was able to develop a dedicated signal processing based on spectral analysis that allows better visualizing of the jet flow. The laureates goes back in Switzerland with a nice framed award, some money and above all the recognition of the quality of his work by the specialists of the UVP field.